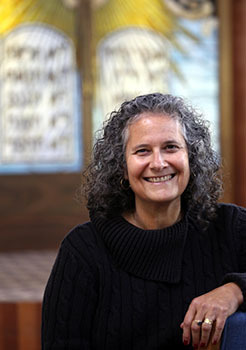 This year’s Tony Hill Award honoree, Paula Marcus, spiritual leader of Temple Beth El in Aptos, applies the Jewish principal of Tikkun Olam, the responsibility to repair the world, in her work and life. For the past three decades, Paula Marcus has been a leader, an organizer, a social justice and interfaith champion. She was an early and passionate advocate for affordable housing, and launched the Twice Blessed movement, reaching out to Jewish LGBTQ community members. She was a key organizer of a march dedicated to the memory of students killed at Parkland. This spring, she co-hosted a march protesting the Trump administration's migrant family separation policy. Now, Marcus’s labors, outreach, community bridge-building and vision are getting the recognition they deserve. Marcus is the 11th recipient of the annual Tony Hill Award, a prestigious honor that is given to bridge-builders and community organizers who embody the spirit of the late social activist Tony Hill. Marcus, senior rabbi of Temple Beth El in Aptos since 2016, will receive the award on Monday, February 11, during the 35thannual Martin Luther King, Jr. Memorial Convocation, celebrating the life and dream of Martin Luther King, Jr. The convocation, featuring Melissa Harris-Perry, the Maya Angelou Presidential Chair at Wake Forest University, starts at 7 p.m. at the Santa Cruz Civic Auditorium in downtown Santa Cruz. Stern has known Marcus for years, and vividly recalls a meeting that Tony Hill and Paula Marcus attended in the '90s. "What I've always respected about her is her calm presence and her real commitment, her connection between her spiritual work and her activism," Stern said. "They were always intertwined. She has done this work not only as a rabbi but as a citizen of our community." Indeed, this spiritual responsibility is part of her daily practice as an advocate and activist. Marcus was a founding member of Out in Our Faith(OIOF), a collective of local faith-based congregations. OIOF has been a local and national leader in supporting religious groups that welcome LGBTQ members. She was also a leader in the creation of Erik Schapiro Knolls, which provides livable housing for farm workers. The gift comes with a $500 cash prize, which Marcus plans to donate to Communities Organized for Relational POWER in ACTION(COPA) an organization that works to assist families and build community connections.